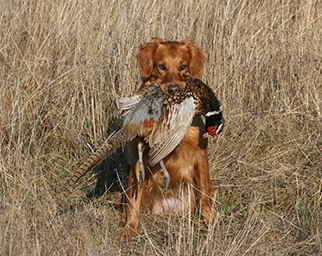 Chloe loves retrieving. She is watery and runs punch birds on land and water with the same passion she has for short birds. Chloe is also very good at running blinds; she runs blinds with the same enthusiasm she has for running marks. When Chloe completes a series and leaves the line, she is clearly delighted about the work she has done. Furthermore, Chloe is a team player. When Linda ran her first field trial, Chloe rewarded her by earning a second in the Qualifying stake. Chloe is a happy upbeat girl that lives in our home. She is qualified all-age and is currently running in all-age stakes. 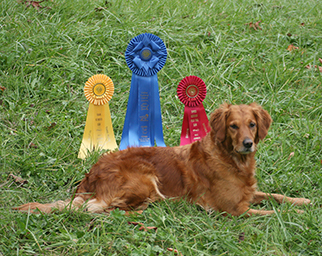 Chloe meets the criteria set forth in the Breed Standard, which earned her the CCA at the National Specialty.